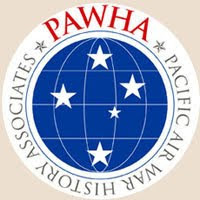 In response to a recent query please note that there are no direct purchase links for the listed Aviation of Japan resource guides. 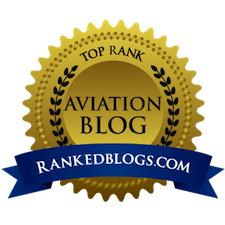 Readers who are interested in acquiring any of the titles should first send an enquiry email with their requirements via the 'Contact Straggler' link in the right hand sidebar. Arrangements for purchase will then be return emailed. Thank you. 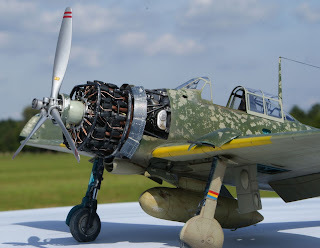 This splendid model of an A6M3 Model 22 Zero was built from the Tamiya 1/32 kit by Artur Domanski and features a superb representation of the appearance of the original '6-171' as seen in a couple of well known images. 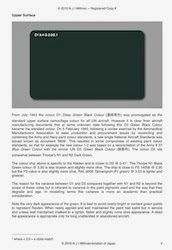 The base coat amber grey colour was mixed from Gunze Mr Color C60 RLM 02 Gray and C366 Hemp in the ratio 51% + 49% respectively. 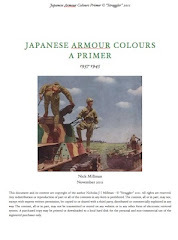 The dark green field camouflage is Tamiya. The wear was reproduced with the maskol and salt technique. The markings are a mix of hand painted and conventional wet transfer decals from HGW. 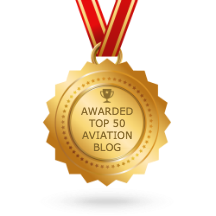 With special thanks to Artur for sharing these images with Aviation of Japan. 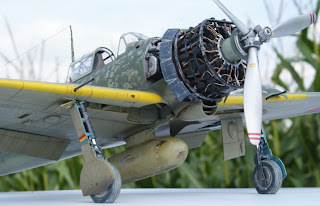 More photos of this model can be viewed here at Artur's own blog Artro219 Modelling, together with many other impressive models demonstrating his skills. Back in March 2014 the pre-painted 1/72 scale Ki-44 instrument panel manufactured by Yahu Models was featured. Since then their range of aircraft sets in the popular scales 1/72, 1/48, 1/32 and 1/24 has been prolific, incorporating both complete, ready to fit panels and set ups requiring sandwiching of photo-etch parts and film sheets for optional possibilities. 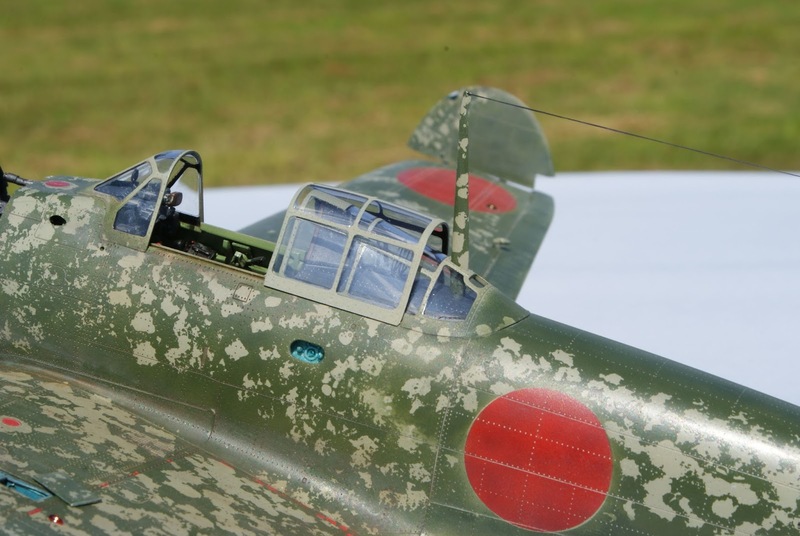 Some panels, such as the Ki-44, are also available for assembly by the purchaser. 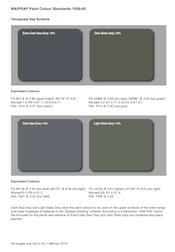 Don't be put off by the colour instruction sheet images which sometimes appear online as the colours of the actual painted panels are very good indeed. 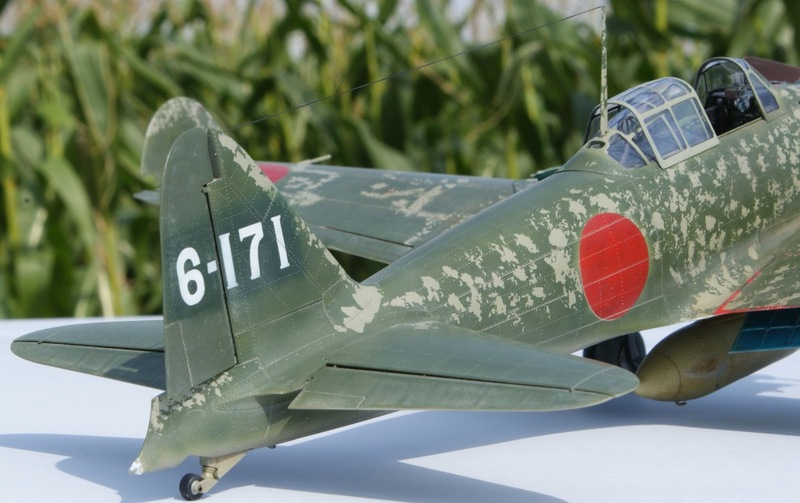 Set YMA7262 (shown above) is designed for the Nakajima-built A6M2 in 1/72 scale. It consists of a basic pre-painted and assembled panel together with a sheet of three additional instruments and can be configured to suit the Tamiya, Hasegawa, Fine Molds and Airfix kits. 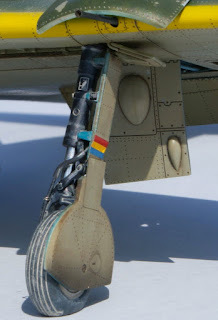 The paint on the panel is matched to Mr Color C127 Cockpit Colour Nakajima. 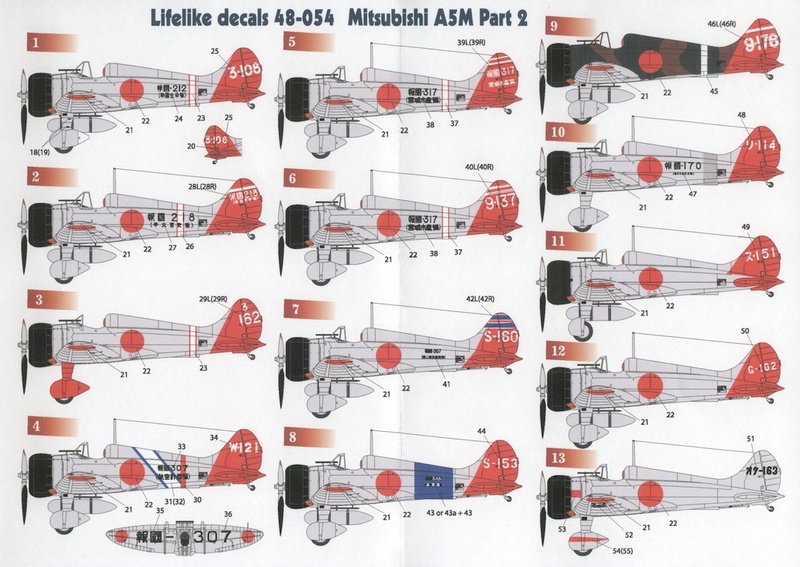 YMA7255 is the requisite set for the Mitsubishi-built A6M2 (shown below) and panels are also available for the A6M3 and A6M5 in this scale. Again all retailing in the UK for £1.99 each which is less than a tin of Humbrol paint. 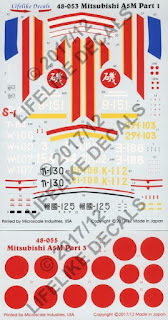 Set YMA7277 (shown above) is designed for the Mitsubishi A5M4 in 1/72 scale to fit both the Fujimi and Hobby Boss/Doyusha kits. Nichimo is not mentioned but I reckon this could be fitted if upgrading that veteran is desired. This set consists of a single, one piece painted panel requiring only a single instrument to be bent into position before fitting into the cockpit. 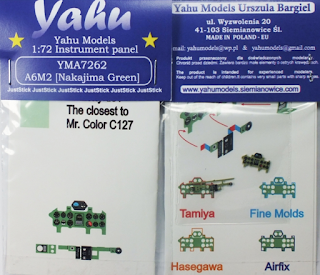 Unpainted, sheet-based photo-etched assemblies can look really excellent when persevered with but some modellers do struggle with the folding and sandwich assembly in 1/72 scale so these sets are an excellent way to add extra detail without stress. 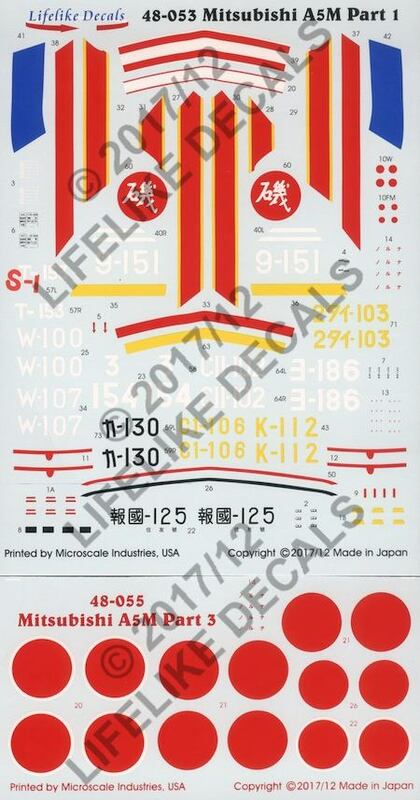 For an open cockpit type like the A5M4 they are especially welcome and the set retails in the UK for only £1.99. 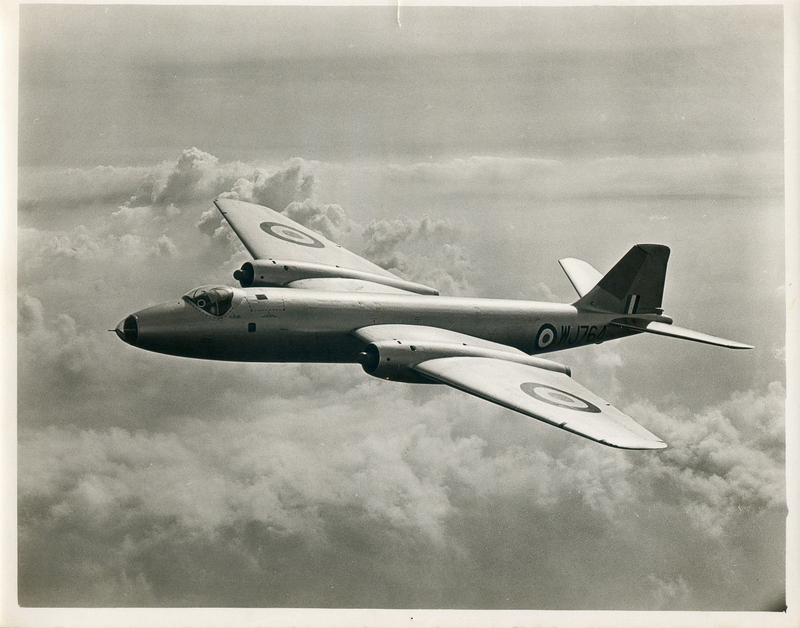 Set YMA7292 (shown above) is designed for the LS/Arii Mitsubishi Ki-15/C5M 'Babs' and again consists of a single pre-painted panel with the colour matched to Mr Color C126 Cockpit Colour Mitsubishi. 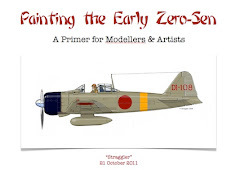 That limits the options if it is desired to paint the rest of the cockpit in the blue-grey Army # 3 colour, and re-painting the tiny panel would be quite a challenge. Mine will go into a C5M! 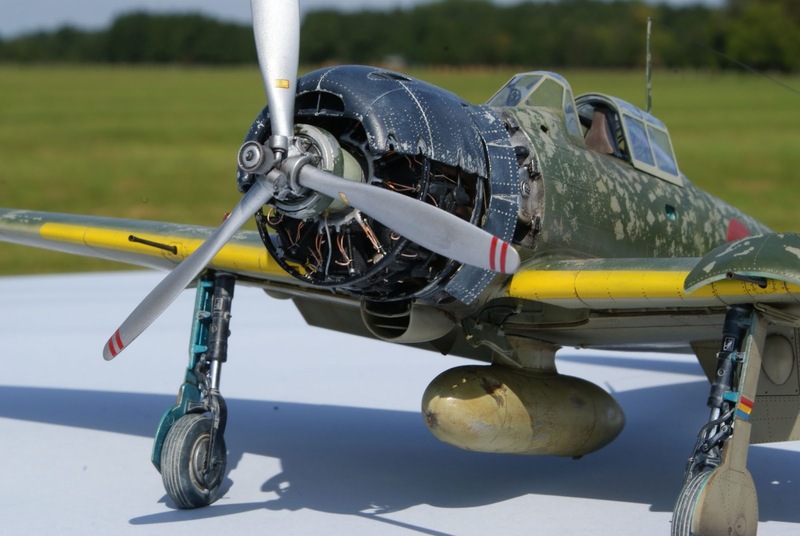 In 1/48 scale set YMA4826 (shown above) is designed for a Nakajima-built A6M2 using the Tamiya kit. This consists of a pre-painted panel and a sheet of additional pre-painted parts. 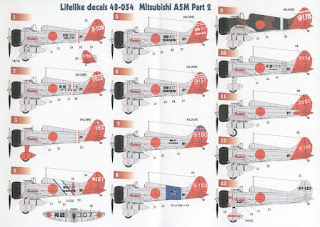 The set for a Mitsubishi-built A6M2 also using the Tamiya kit is YMA4825. 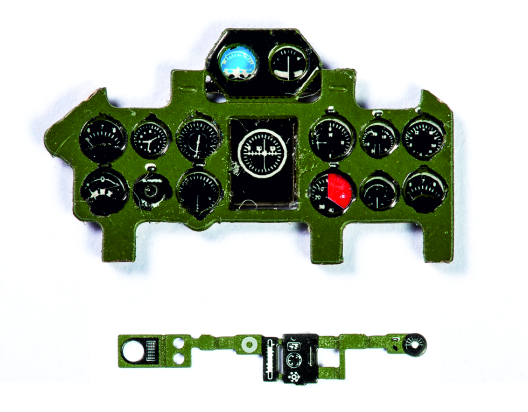 Set YML4801 (shown above) is designed for the Hasegawa E8N1/2 'Dave' floatplane and consists of five pre-painted parts for the pilot and observer cockpits which require sandwich assembly to create two panels and the observer's rear bulkead. Set YMA4857 (shown above) is designed for the A5M2 using the Wingsy or Special Hobby kits and consists of a single pre-painted panel with an additional sheet of pre-painted instruments and parts for early and late variants as well as cockpit wall placards. 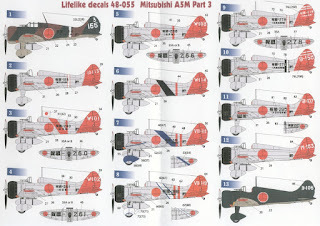 In March this year sets were also released for the Ki-43-II as YMA4865 designed for the Hasegawa or Fine Molds kits and for the Ki-44 as YMA4868 designed for the Hasegawa or Arii kits. 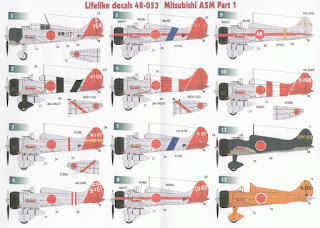 In 1/32 scale sets are available for the Mitsubishi and Nakajima-built A6M2 designed for the Tamiya kit as YMA3224 (shown above incorrectly labelled for a Hasegawa kit and corrected on released sets) and YMA3234 respectively, as well as for the Hasegawa Ki-44 kit as YMA3230. 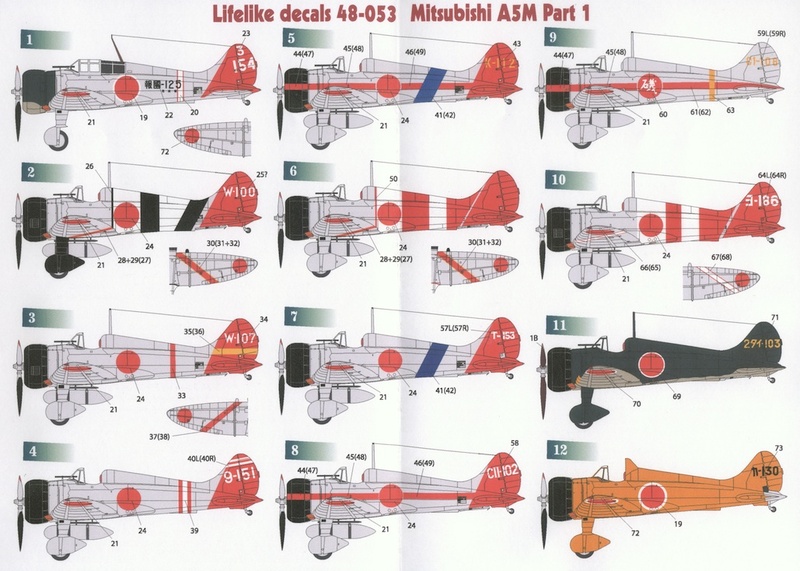 Sets for the Trumpeter 1/24 A6M2 are also available for Mitsubishi or Nakajima-built variants as YMA2403 and YMA2406 respectively. 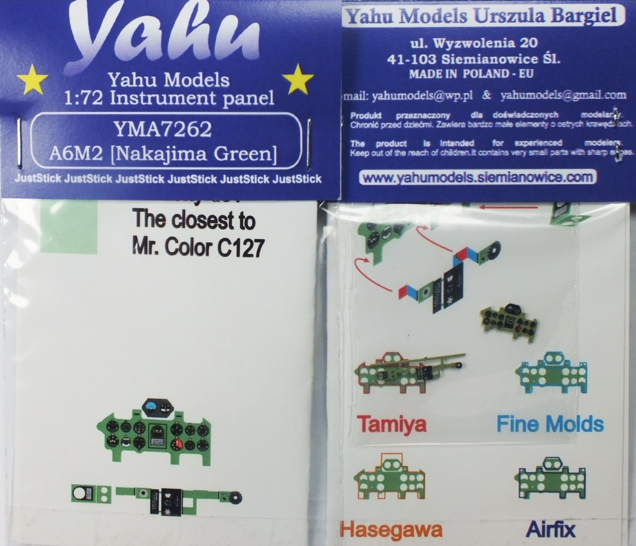 The Yahu Models sets are little gems and highly recommended for all modellers, but especially those embarking on aftermarket detail additions for the first time. 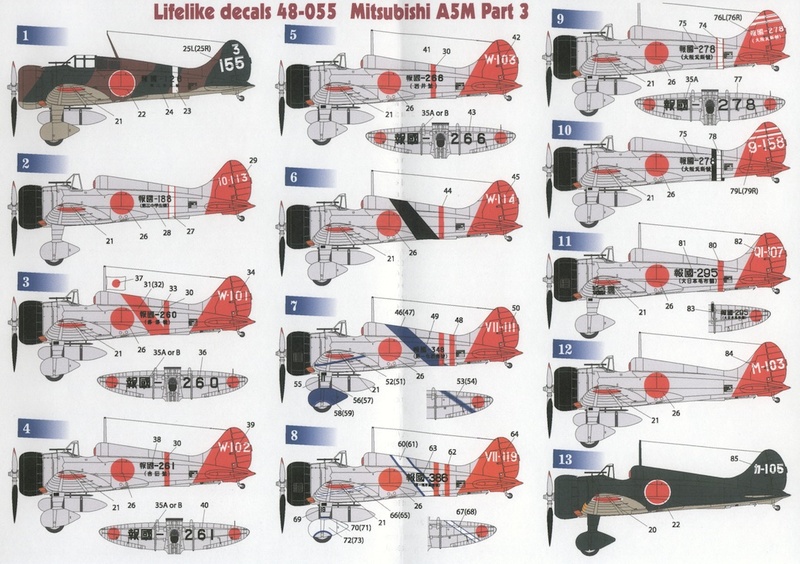 Hopefully more Japanese aircraft subjects will be forthcoming, encouraged by sales. The sets are available across the world from the retailers listed here. With special thanks to Urszula of Yahu Models for the review samples.